It is with sadness that we confirm the death of Sam Melbourne on Wednesday August 7th. Sam was born in the great GAA parish of Moycarkey Borris in 1923. Sam played hurling in his youth and was on the Mid Tipperary minor hurling selection in 1940 & 41. Sam carved out a special niche for himself in GAA history by his collection of GAA memorabilia that is famous not alone nationally but much further afield. Sam commenced his collection in 1937 with a Hurley he received from Johnny Ryan an All-Ireland medallist that year. The collection subsequently grew to over three hundred Hurley’s from former stars in every County in Ireland. His sports shop in Thurles in the fifties was a colourful place with photos, scrapbooks, newspaper cuttings and jerseys of former players attracting people from far and wide. Sam moved to Dublin in 1956 and from there he travelled the length and breadth of the Country in his Hiace Van displaying his vast collection of GAA memorabilia to clubs and communities and giving talks about his collection. 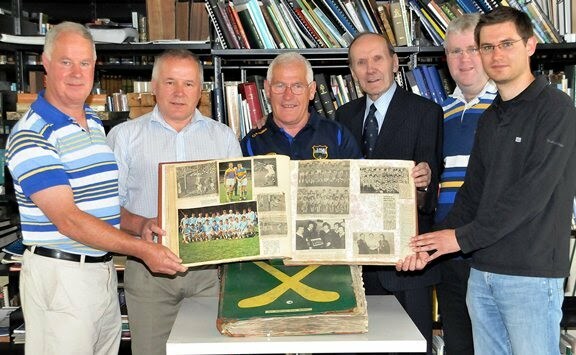 When that was no longer possible Tipperary County Board purchased the collection in 1988 and the items are on display in Lár na Páirce while photos scrapbooks and newspaper cuttings are to be found in the Sports Section of Thurles Library for the pleasure of all to see. The GAA are indebted to Sam for his lifelong love and dedication to our great association and the fruits of his labour will continue to be enjoyed as future generations inspect his wide array of GAA memorabilia. Sam was Vice-President of the Moycarkey-Borris GAA Club at the time of his death. Our deepest sympathies to the Melbourne family. May he rest in peace. Melbourne Sam (Villa Park, Dublin 7) August 7th. 2013 (peacefully) at home, in his 91st year. Sadly missed by his adored wife Charlotte, his children Edgar, Desmond, Alan and Ruby, his daughters-in-law and son-in-law, ten grandchildren, five great-grandchildren, sisters-in-law, nieces, nephews, relatives, neighbours and friends.